DogsBite.org - For several years now, after posting our annual fatal dog bite statistics in January, we release a combined year dog bite fatality chart that depicts the breeds most responsible for these deaths. For instance, in both the 7-year and 8-year combined charts, pit bulls contributed to 60% of the total recorded deaths. 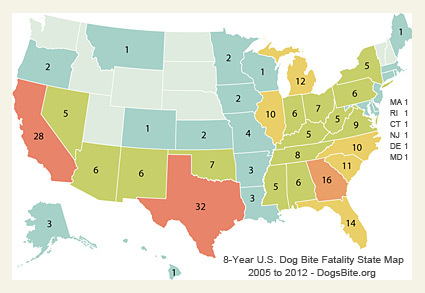 For more visual information, we've created a combined year dog bite fatality state map that shows the number of dog bite fatalities by state. The state map is another downloadable educational tool created by DogsBite.org for dog bite victims' advocates, law enforcement, attorneys, doctors and researchers. In addition to these downloadable PDF files, DogsBite.org also maintains interactive Google Maps, specific to pit bull fatalities, for about a dozen of the most troubling states. The Google Maps track by state: fatal pit bull attacks, breed-specific laws, dog bite injury studies, legislative milestones and more. To discuss the state map in more detail, we've added new columns to Chart A and created a state death rate chart for comparison, Chart B. The death rate demonstrates the number of dog bite fatalities per 10 million population within that state over the 8-year period. This rate was calculated by using state population data from the U.S. Census Bureau for each year (2005 to 2012). The dog bite death rate is based upon the combined population of each state over the 8-year period. § Indicates states with full or partial anti-BSL law. In California, pit bulls contributed to 82% of all dog bite-related fatalities during the 8-year period.Texas led the nation over the 8-year period with 32 deaths followed by California (28), Georgia (16), Florida (14) and Michigan (12). Generally, a higher number of dog bite fatalities occur in the Southern United States. Of the top ten states leading fatal dog attacks, 70% fall within the southern geographical region. Also, with the inclusion of California, which only allows breed-specific spay and neuter ordinances, half of the top ten states are governed by anti-BSL preemption laws. The columns, Pit Bull Deaths and Percent Pit Bulls, were added to show the variable: Of the total number of dog bite deaths by state, how many were inflicted by pit bulls? During the 8-year period, 32 dog bite fatalities were recorded in Texas. Pit bulls accounted for 75% of these deaths. As readers can see from Chart A, California even surpassed Texas, where pit bulls inflicted 82% of all deaths. Illinois and North Carolina show that pit bulls contributed to 70% of all dog bite deaths. † Indicates states within the Southern United States. Shaded indicates states that appear in both charts. 60% of the states also fall into the bottom ten positions of states with the lowest median household incomes.2Many readers might be surprised to see Alaska in the number one position. Alaska, however, is a low populated state with distinctive geography. There is also a disproportionate number of Alaska Native people afflicted by serious dog bite injuries and deaths that may be due to unique conditions and activities which include: high risk hunting, mushing, and living in remote and inaccessible areas. (Learn more: Hospitalizations Resulting from Dog Bite Injuries - Alaska, 1991-2002). South Carolina, Georgia, Texas and Tennessee appear in both charts (shaded). In contrast, Illinois, California and Florida, each included in Chart A, fall below the national death rate of 1.03 per 10 million population, as did New York, the third most populated state, behind California and Texas. As one can see, high population is not the chief predictor for dog bite fatalities. What is predictable is that 70% of the states in Chart B, again, fall within the Southern United States. There were nine states that incurred no dog bite-related deaths during the 8-year period, including: Idaho, Nebraska, New Hampshire, North Dakota, South Dakota, Utah, Vermont, Washington, and Wyoming. Washington state stands out as the only state with a combined 8-year population of over 52 million that did not incur any fatalities. Of these states, seven had 8-year populations of 14.4 million or less. None of these nine states are part of the Southern United States either. Editorial note added March 8, 2017: Updated Chart B and related content to show the death rate of per 10 million population, as well as used a combined 8-year population instead of a rolling base average. 1In February, DogsBite.org issued a report detailing dog bite fatalities in the state of Texas. That report covered a time period of just over 8-years (January 1, 2005 to February 17, 2013). At that time, we noted California in a footnote, but had not reviewed the percentage of deaths inflicted by pit bulls. 2Mississippi is dead last, followed by West Virginia, Tennessee, New Mexico, South Carolina and Oklahoma (2011 to 2004 Wikipedia). CONCLUSION: BSL Never works for dog fighters and pit breeders!